Worcestershire Rapids regained top spot in the Vitality Blast North Group as they overcame Derbyshire Falcons by 16 runs in a low-scoring and tense affair at Blackfinch New Road. Joe Clarke’s superb 76 held the Rapids innings together with fellow opener Wayne Parnell (12) the only other player into double figures in a total of 137-8. But the home bowlers held their nerve to seal the victory that enabled the Rapids to leapfrog over Durham Jets into pole position as the Falcons closed on 121-7. It was their fourth successive win either side of a wash-out and put them on the brink of a quarter-final spot. But defeat was a big blow to the Falcons hopes of reaching the last eight. The Rapids opted to bat first and their innings was dominated by Clarke. The Derbyshire attack produced a disciplined performance with Hardus Viljoen (3-25), Wahab Riaz (2-20) and Ravi Rampaul (2-23) all impressing. Clarke immediately looked in good nick, turning Wayne Madsen off his legs and through mid-wicket for boundaries in the opening over. Parnell was promoted in the absence of Moeen Ali on England duty hit, was caught by keeper Gary Wilson off a skier from the bowling of Rampaul. 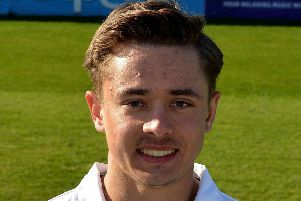 Callum Ferguson, who this week committed to becoming Worcestershire’s main overseas player in 2019, made only nine before he was trapped lbw by Viljoen. The next ball accounted for Brett D’Oliveira (0) who played Viljoen to mid on and was run out by Madsen’s direct hit at the non-striker’s end. Clarke completed his second half century of the Blast campaign from 36 deliveries with a flick off his legs for four off Lockie Ferguson. It contained two sixes and six fours. The England Lions player survived a difficult chance when on 67 against Wahab Riaz with Viljoen failing to cling onto the low chance at long off. Ben Cox (8) pulled Riaz straight to mid wicket and Ross Whiteley (4) attempted to flick Rampaul over backward point and hit the ball straight to Viljoen. Clarke’s knock ended when he played a ramp shot against Viljoen and Lockie Ferguson held onto the chance running back to third man. The wickets continued to tumble with Ed Barnard (7) bowled by Viljoen’s next delivery and Daryl Mitchell (2) yorked by Riaz. The Rapids needed to make early inroads – and on loan Nottinghamshire paceman Luke Wood trapped Ben Slater (0) lbw in the first over. It set the tone for the remainder of the powerplay. Riaz (6) drilled Parnell to D’Oliveira at mid off and then Barnard broke through in successive overs. Calum MacLeod (11) was stumped and Wayne Madsen (2) cut straight to George Rhodes at point with the total 28-4 in the seventh over. The Falcons needed to rebuild and Godleman and Wilson responded in positive fashion during a partnership of 53 in eight overs. Godleman batted sensibly in making a run a ball 38 but then holed out to Barnard at deep mid wicket to give Wood his second wicket. Pat Brown then returned to the attack to bowl Wilson for 35. He claimed his 22nd victim of the season in the final over by dismissing Matt Critchley and set a new County record for a campaign, overhauling the 21 by Saeed Ajmal in 2015.